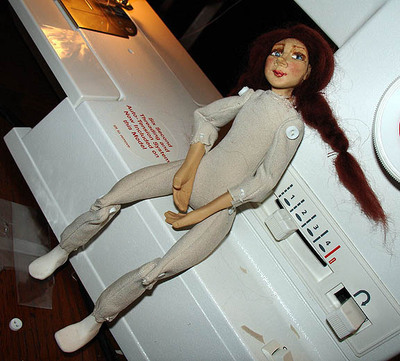 Here is a smaller doll I have been working on, she was the first pancake. (So if I mess her up, I won't feel too attached.) Although crude, things are going pretty well. She is just practice after all. Her head, hands & feet are polymer clay. I did her feet in white stockings. She's 9" tall, why do I keep thinking making smaller things are easier? I'm sure they are not! 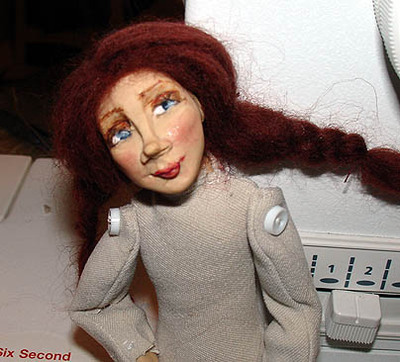 Her hair is wool roving, thanks to some tips on creating a hair part from doll-maker, Antonette Cely. Don't you just love google? I glue on the under layers, the part is sewn together and then separated. Very easy to do. Her face is done with oil paint and liquid sculpey. I did a button-joint body, so that she bends at the shoulders, hips and knees. I fizzled out on the elbows, but now I wish I had! I ordered this doll-making book last night. Anyone have any good book recommendations or websites I need to see? Please share. Now I need to think about clothing. I'm just learning to sew, I can handle some simple things. I'm in love with this doll-maker's work and her clothing. Wish me luck! Hi - just wanted to say I stumbled across your blog while googling for images of needle-felting (yes, I love Google too!) and then spent an hour reading about all your various crafts, arts and enterprises. I've found what I read here really inspirational - I'd love to work from home with my own crafts (making tiaras commercially, but beading and PMCing and perhaps, well, some needle-felting too, because I love all those things) and your approach to life/work is helping me see much more clearly! :-) I do like your doll, by the way. I laughed out loud when I read that you're suddenly 'into' dolls and yet you're not a 'doll person'. Neither am I, yet I found myself possessed by the urge to make cloth dolls last month, and I'm still at it! Please keep posting - you have a beautiful, sunny and inspirational blog.